Fully furnished + Renovated kitchen! • 2 bath , 2 bdrm single story – FOR SALE USD198,999 . Best price in this area! 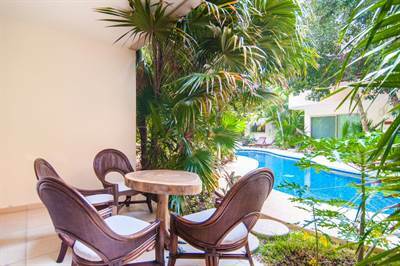 Fully-furnished 2-bedroom condo for sale in Tulum, Riviera Maya, Mexico. This condo backs onto the protected green area behind, meaning you will always have a view of the nature reserve from the bedrooms. The main living area opens to the terrace, where you can jump directly into the pool. Lush and matured landscaping still offer privacy from the main deck, so great combination of privacy yet perfect for entertaining by the pool. * Shared central pool with beach chairs. * Laundry room with washer/dryer. * Fully-equipped kitchen (recently renovated). * Marble countertops / wooden cabinetry. Aldea Zamá is an ecological and urbanized community, fully adapted to the surrounding forest and natural environment. It is located in a privileged area and it is immersed in the Mayan jungle, minutes away from many local attractions: the archaeological site, downtown, the beaches and the hotel zone of Tulum (click “Map” above to see the exact location). Aldea Zamá is a pioneer in its unique concept of offering first-class services and a combination of urbanism and nature. It has become an icon within the community of Tulum. Tulum’s ideal weather, the wonderful jungle, and the mesmerizing Caribbean waters invite you to stay forever. The ancient Mayas named it Zama or “dawn”. Today, it is worldwide known as Tulum, which means “wall”. Its ruins still look onto the crystal clear coral reefs. This large ground-floor condo for sale in Tulum is truly a great turn-key investment opportunity and is the best-priced condo in the area, so it won’t last long in the market! Call us now for more information or to schedule a viewing. This entry was posted in Riviera Maya Real Estate by Judi Shaw. Bookmark the permalink.